On Tuesday, Roger Stone was interviewed by Chuck Todd. One segment is included above. What follows is a partial nonverbal analysis of a particularly telling behavior pattern exhibited by Mr. Stone. CHUCK TODD (beginning at 0:00): Did, um, you suggest to the President that he [stutter] at that press conference say, "Russia, if you're listening - ahum, go find Hillary Clinton's emails"? CHUCK TODD: [over-talking] You never had a single discussion about Hillary Clinton emails, ah, with him at all? ROGER STONE: That is correct. CHUCK TODD: Nothing about Hillary Clinton [slurring] I understand Wikileaks - Not once about Hillary Clinton emails - You never had one conversation with President Trump about that? ROGER STONE: Not, not a single one - no. Absolutely not. CHUCK TODD: [over-talking] And that's the same answer you're going to give if Mr. Mueller asks you that question? ROGER STONE: It's the same answer that I gave the House Intelligence Committee under oath, ah, months ago - it's certainly the same answer I would give the special counsel [stutter] ah, ah, Donald Trump and I - have never discussed the matter. Note that Mr. Stone blinks very frequently during this entire 47-second video. An increased frequency of blinking (above baseline) is a nonspecific, but highly reliable, indicator of anxiety. Yet there's more nuance revealed here. Go back and watch the video once again. Notice also, that some of Roger Stone's blinking is of incredibly long duration. Most of these extended blinks are either simultaneous with his verbal denials - or a split second after Chuck Todd asks him a particularly crucial question or uses a keyword. These moments of Roger Stone's extended blinking are highlighted in the above dialog in red. It's possible, perhaps, that Mr. Stone has an ophthalmic condition which causes him to blink more often (e.g. Dry Eye Syndrome). However, if this is true, it still doesn't account for the timing of his extended blinking - once again, highly coincident with his denials and/or with Mr. Todd's evocative words/questions. Thin-slicing his blinking even further - when two adjacent tissues are moving in opposite directions - particularly as part of a facial expression - it sends up a tremendous red flag. 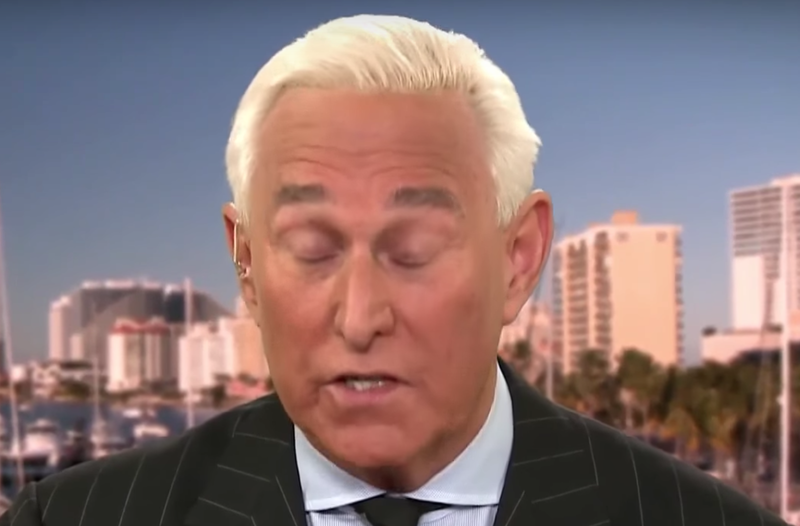 Note the image immediately above - Roger Stone's forehead muscles are contracted and vectored upward - whereas his eyelids are in the midst of an extended blink. This opposite-direction dynamic is unnatural and is a profound nonverbal analog of, "The gentleman doth protests too much, methinks (apologies to William Shakespeare)." There are some interesting paralanguage/statement analysis tells here as well. Whenever someone says, "I can honestly say" - with high probability - they're lying. Additionally, Mr. Stone's use of "That is correct" - is a non-contraction (e.g., as opposed to "That's correct"). In the act of telling a lie (here, a false affirmation), people will have a strong tendency to use non-contractions. But when the same person speaks the truth, they'll tend to use contractions. Summary: Roger Stone's clusters of nonverbal, verbal, and paralanguage behavior exhibited in this video are highly consistent with multiple examples of deceptions. More specifically, with extremely high probability, Roger Stone and Donald Trump did discuss the WikiLeaks emails prior to the 2016 Election.